‘An American Werewolf In London’ Remake In the Works? The reboot/remake train just keeps on roiling along. 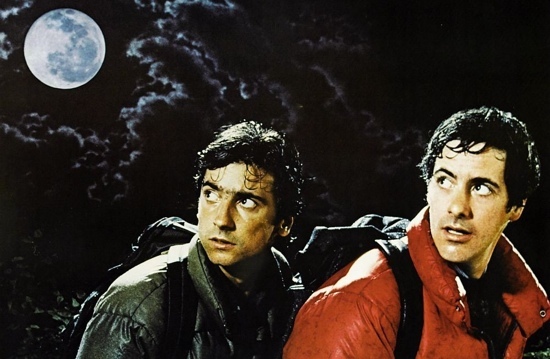 Now we can add John Landis’ 1981 horror/comedy An American Werewolf In London to the list of movies getting a “refresh” — at least according to a tipster who dropped some info over at Bloody Disgusting. In the article, the tipster reveals that writer/director Landis himself may be responsible for setting the wheels in motion on the reboot by selling his remake rights to Dimension Films. Producing the film for Dimension will reportedly be the Weinstein brothers, who are currently about to launch Halloween II into theaters and are also hard at work on a reboot of yet another horror franchise: Clive Barker’s 1987 film Hellraiser. In case you’re not familiar with Landis’ original film, it concerns two friends traveling in England who are attacked by a werewolf. One of the friends is killed but the other survives and begins to change and become a werewolf himself — much to the dismay of his new girlfriend, a nurse he met while recovering from the attack. In truth, this movie is one of my favorite horror/comedies of all time and I was actually discussing and recommending it to some friends just the other day. This particular reboot seems like a very bad idea. The original film was great and achieved just the right mix of horror, action, suspense, romance and gore making it a very tough act to follow — as evidenced by the abismal sequel An American Werewolf in Paris. I know reboots and remakes are inevitable but I also know, especially in this case, there’s pretty much no way a reboot will ever live up to the original.